The 5.45x39mm Soviet cartridge was a relative stranger to the mainstream American firearms market until recent years. About a decade ago, this cartridge — once only seen in the AK-74 family of rifles — started taking a foothold in the AR world. Companies like Smith & Wesson and Spike's Tactical were among the first to offer AR platform rifles chambered for the 5.45x39mm. In 2011, I finally broke down and got my first AR-15 in a non-NATO chambering. It began life a S&W M&P-15 with an M4 profile barrel, A2 front sight, A3 flattop upper and mil-spec buffer tube with an M4 collapsible stock. Within a year, the rifle was nearly unrecognizable. I cut, crowned and threaded the barrel to the 12-inch mark, re-manufactured it as a post- '86 dealer sample machine gun and installed Colt full-auto fire control. The rifle also became equipped with a WMD Guns M16 bolt carrier, KNS Precision non-rotating pins, a Magpul CTR stock, Knight's URX 10.75-inch rail, EOTech XPS3-0 optic with GG&G cover, Magpul K2 grip, and the one very necessary component: an extra power hammer spring from Wolff. Not familiar with the extra power hammer spring? That's because a 5.56 NATO AR does not require it. The extra primer striking power is needed to reliably set off surplus Russian 5.45 ammo such as the infamous 7N6, the load carried by the Russians in Afghanistan. The theory behind this re-build was to have a dealer sample machine gun to do full auto law enforcement demos without breaking the bank. At that point, 7N6 ammo cost less than seven cents per round. As time went on and ammo prices rose, it became less practical for this application. Jumping forward a couple years, I found myself heavily involved in the firearms training arena, both as a student and an instructor. I began teaching foreign weapons identification and handling classes to various law enforcement organizations, as well as attending carbine tactics classes from multiple instructors. The author attended a training course in 2013 with his custom AK. In fall of 2013, I was preparing for a class in Arizona when I suddenly had the urge to bring a firearm that was not in my current inventory: the AK-105. The AK-105 is a compact version of the modernized AK-74M. It features the side-folding polymer stock and full-length gas system of the 74M but sports a front sight/gas block combo and a barrel length of only 12-inches. It is the halfway point between the 16-inch barrel of the AK-74M and the 8-inch barrel of the AKS-74U. Since there are no true AK-105s on the US market, building a clone seemed like the best way to round out our training inventory. The first incarnation of this clone consisted of a factory 12-inch Steyr barrel, with mostly Bulgarian parts; trunnion, bolt, etc. It had black Russian handguards with a black Russian AK-100 series stock, a Nodak Spud NDS-2SF receiver, a Bulgarian four-piece flash hider, Magpul AK pistol grip and an original Russian 500m rear sight. The rifle also received a Flat Dark Earth/Mil-Spec Green Cerakoting treatment for a field expedient camo finish. With the M&P-15 having been used mostly for full-auto demos on a square range, and the AK-105 being a brand new build, I set off to compare the performance of both compact rifles in training classes. Iron sights were not the author's preferred aiming solution. The AK-105 made its way through the ringer first at Haley Strategic's Adaptive Kalash One in Casa Grande, AZ. My anticipation of testing out the new creation turned quickly to disappointment. The rifle was not as accurate as I had hoped. Its 11-inch sight radius and rear leaf sight weren't cutting it. After firing about 500 rounds the first day with the 105, I switched to my AKS-74U for the remaining two days. The 105 experienced no mechanical failures of any kind, but I figured if I was going to deal with a short sight plane, I was going to use my krink instead because looking good is half the battle right? OK maybe not, but I just wanted to go back to my krink after the first day's disappointment. The rest of the class went well and I shelved the 105 for a few months. Midwest industries KeyMod forend with an Aimpoint and Urban Croc Cerakote finish. Just before SHOT Show 2014, Troy Storch of Midwest Industries sent one of their new Keymod AK handguards with a top cover mount for a 30mm Aimpoint. I decided to give the 105 another shot and used the Midwest handguard to mount an old reliable Aimpoint CompM2 in what Colonel Cooper would have referred to as a scout rifle configuration. It was necessary to mount the optic in a forend position because mounting it over the AK-105's top cover prevents the cover's removal, which is essential to clearing a rare but possible malfunction: a spent case finding its way behind the trigger group. Happy to have a solid optic mounted out of the way, I sent the rifle to Boyd at Hillbilly223 for his "urban croc" Cerakote finish. I brought it to SHOT Show 2014 where it received excellent feedback. However, the rifle still had some vetting left to go. Come fall of 2014, I found myself packing for yet another Travis Haley class. This time it was his Disruptive Environments Carbine Vehicle/Darkness class in Victoria, TX. This class was clearly aimed at the AR/M4 platform so I dusted off the M&P-15 in 5.45x39mm and hit the road for Texas. 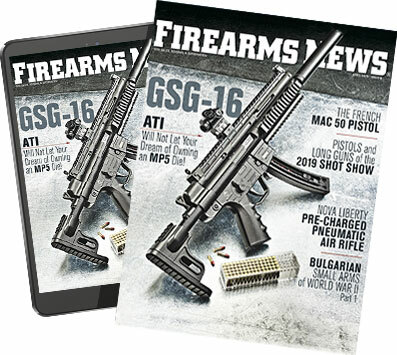 This is a good time to point out the major downfall of any 5.45x39mm rifle on the AR platform: magazines. I've tried a few different mags with this specific caliber from C Products, as well as modified FNC mags, Mapgul EMags, modified PMags and ASC 5.45-specific mags, etc. AR vs. AK-style magazine comparison. What is problematic is the taper of the 5.45x39mm cartridge. The AR platform requires the top three inches of the magazine to be straight to accommodate the AR's mag well. The overall length of the 30-round M16 magazine is about seven inches, where in comparison the overall length of the AK-74 mag is about eight inches and tapered from top to bottom. As surprising as it may sound, the most reliable magazine I've found for using the 5.45x39mm in the AR/M4 carbine is the C Products mag. It will hold all 30 rounds in its 7-inch body and to date had performed near flawlessly for me. The first half-day of the class went well with no malfunctions, but after dinner when we came back for the low light/no light drills, I began having a few double feeds. Within an hour of the first double feed, a failure occurred that was all new to me: total magazine spring failure. In the middle of a drill, I suddenly had a dead trigger. Looking into the ejection port, I saw two or three rounds stuck in the action. After dropping the mag and clearing the action, it became apparent that cartridges were just loosely falling out of the magazine body. I drew my pistol, finished the drill, and stowed the problem mag in my cargo pocket for later inspection. After the evening debrief, I cleaned and lubed the rifle and inspected the broken magazine. The magazine spring had completely sheared about halfway up its length. It is worth noting that I shoot approximately 400-500 rounds of corrosive surplus ammo per day during these classes. At the end of each day, my M&P was in desperate need of cleaning. The action was sluggish and gummy. However, I made repeated effective hits on target through each of the 12-hour class days. Even with a 12-inch barrel, I was still hanging with 16-inch 5.56 M4s all day. The class included an entire day of firing through and around static vehicles including through their windshields, and the 5.45x39mm M&P-15 hung with its bigger, more American cousins. While multiple double feeds and a total mag failure occurred, my carbine was not alone in these issues. Anyone who has been to a 3-day carbine class knows any and all AR rifles can and will experience failures. For being chambered in the "wrong" cartridge, my M&P-15 rifle held its own. I left the class feeling more confident in my shooting skills with this weapon than I had felt with my AK-105 in the previous class. The EOTech optic really made a difference in my effect on target, but I missed the uncompromising reliability of the AK platform. I needed to get my re-vamped AK-105 out to a class and see if I had found a perfect marriage of reliability and accuracy. Vince Buckles (Left) attends a course with Larry Vickers (Right). A couple of months later, I was invited to attend a Vickers Tactical AK Operator class. This was the perfect opportunity to further vet the final version of the AK-105. I flew to Fayetteville, N.C., without even bringing a backup rifle. It was going to be a make-or-break weekend. Shooting from the 3-yard line all the way back to the 200-yard line, the AK-105 met all of my initial expectations. Accuracy wise, its performance was spot on with that of my M&P-15 SBR. I would go so far as to say it was as good as that of 16-inch M4 carbine with similar optics and military ball ammo. There were zero mechanical failures of any kind, besides stoppages purposely set up by the class for the sake of learning to clear them. The AR-15's thumb safety selector is simple and intuitive. No comparison of these two platforms would be complete without talking about the ergonomics of selector manipulation and speed of magazine changes. The AR selector is an absolutely simple mechanism that even a child could figure out. The stock AK selector, on the other hand, is a little trickier for the untrained user to operate to its potential. Years of rolling my hand up to the AK safety lever as I bring the weapon up from the low-ready to the target has paid off. This last go-round, I was running my AK safety as fast as an AR safety, and the shot timer numbers proved it. My AK mag changes share a similar narrative. With practice, its certainly possible to change AK mags faster than AR mags. While the AK magazine latch may seem tricky at first, it has one very strong advantage: you'll likely never have to tap-rack-bang an AK platform rifle. You know when the mag is in all the way. Inserting a mag on a closed bolt is the norm on the Kalashnikov, therefore speed reloads and tactical reloads give the same positive click when inserting the mag. Inserting a full AR-15 mag on a closed bolt can be another story entirely. I did not set out to prove one platform works better than the other. Comparing these two rifles was simply an afterthought of two years trying to find the best all-around SBR for my needs. The most important lesson learned was that without regular training outside of my comfort zone, I probably would have never vetted these two firearms the way I have. Just recently, I told Larry Vickers, "The biggest advantage of training at least for me is learning what gear simply doesn't work the way I want it to." I'm happy to say that I have finally found the ideal SBR that performs exactly to my standards. It took two years and a lot of time and money but I can finally say I am completely satisfied with my AK-105. The author's ideal 5.45x39mm SBR is this completed AK-105.